For about the cost of regular bath linens and bath towels, you can completely upgrade your bathing routine with our selection of exquisite Japanese towels. They last forever (nearly), make you feel great, and require no special care other than tossing them in the wash once a week. Regular weave come in yellow #7101, pink #7100, and pink stripes #7098. Also available in harder weave: in green #7103, blue #7102, and blue stripes #7099. TrueRenu has one of the largest Japanese Wash Towel collections available - from the award-winning Salux brand, the Cure series and luxurious silk from OHE, and our newest line from Aisen. 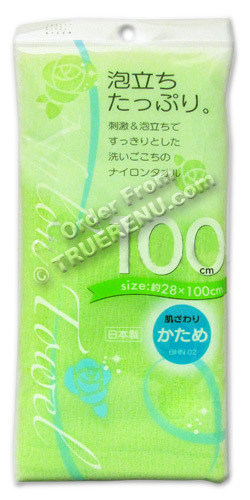 TrueRenu does the searching - and researching - for you, scouring the world for hard to find, hard working products. We carefully evaluate them, making sure that do what they promise, and we bring them to you with detailed descriptions. Ingredients: 100% Nylon, hard texture. Product Size: Pink & White Stripe. 28cm wide x 100cm long (about 11 x 39 inches).